Hurricane Harvey is seen approaching the Texas Gulf Coast in this NOAA GOES East satellite. CORPUS CHRISTI, Texas — Hurricane Harvey intensified into a Category 4 storm as it churned toward what was certain to be a devastating landfall near this city by early Saturday morning. 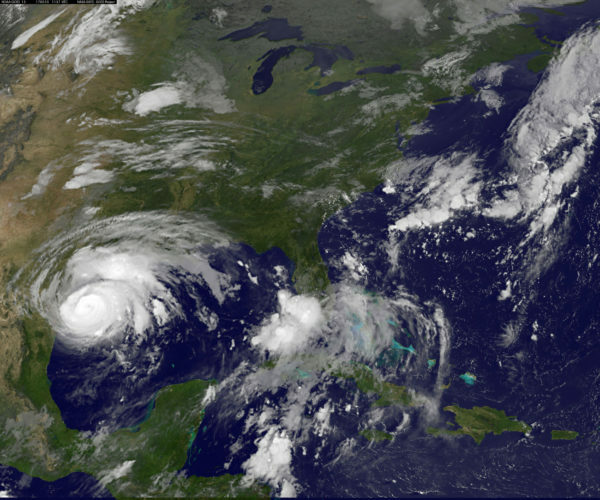 The storm was on track to be the first major hurricane to hit the United States since Wilma in 2005. Forecasters and government officials warned of a full-blown natural disaster, with catastrophic flooding, ferocious winds up to 125 mph and a storm surge that could reach 12 feet. Soon after the outer bands of Harvey reached the South Texas coast, Gov. Greg Abbott on Friday afternoon urged citizens to evacuate immediately low-lying and coastal areas. He sent a written request to President Donald Trump asking him to declare a major disaster in Texas. White House officials said Friday that the declaration is under consideration and that Trump is contemplating visiting Texas sometime early next week. Here in Corpus Christi, city and county officials said they are ready for the worst. But many residents were nervous as the storm approached Friday. In nearby Aransas Pass, 66-year-old Mike Taylor said he was resigned to riding out the storm in his one-story house just a few blocks from the water. As part of routine hurricane preparations, the town maintains a list of residents who need help in leaving. Taylor, who does not own a car and lives with his disabled 40-year-old son, said he thought he was on the list. No one came for him. Several hundred miles of the Texas Gulf Coast are under hurricane and storm-surge warnings. Harvey is expected to stall over the coast and could even drift back out over open water, drawing fresh energy from the hot gulf waters before meandering ashore again closer to Galveston. That scenario would deliver historic amounts of rain to the region, with some models showing accumulations in feet rather than inches. Flooding is likely in and around Houston, the nation’s fourth-largest city. “Small streams, creeks, canals, and ditches may become raging rivers. Flood control systems and barriers may become stressed,” the National Weather Service said in an advisory Friday. Jennifer Cantrell, 37, a Houston social worker who endured Hurricane Ike in 2008, bought four 40-pound bags of topsoil to place at the foot of her door in her first-floor apartment. The Texas Military Department deployed about 700 members of the State Guard and National Guard around the coastal region on Friday as the storm moved in. Black Hawk and Lakota helicopter crews were put on standby for search and rescue. The American Red Cross mobilized staffers from across the country. Paul Carden Jr., regional disaster officer for the Red Cross’ National Capital Region in Washington, said in Corpus Christi that residents are foolish if they decide not to evacuate. After the storm, the Red Cross will be providing cleanup kits, health and mental health professionals, and spiritual-care workers to help residents cope, he said. “This is going to try a person’s faith,” Carden said. A steady and orderly stream of traffic flowed out of Corpus Christi, heading for higher ground inland. But many thousands of people have decided to ride out the storm. Friday morning, residents Phyllis Sweeney and Gary Balding told their story of fleeing the wrath of tropical storms. They live on a 41-foot sailboat, having moved to Corpus Christi from Key West. Two weeks ago, they tried to sail to the Yucatan Peninsula in Mexico but were battered by Hurricane Franklin. Now they’re in the path of Harvey. They fled the boat early Friday and checked into the Holiday Inn downtown. The hotel has become a refuge for stranded tourists, boaters, storm chasers and journalists. But Sweeney, 70, is worried that the hotel, which is surrounded by several other skyscrapers, will also suffer significant damage. “I’m worried about the roof of this building, and if we get chased off the boat and chased out of this hotel, it’s not going to be fun,” she said. In the ranching town of Kingsville, about 40 miles southwest of Corpus Christi, Nick Harrel III, 65, who runs Harrel’s Pharmacy and Soda Fountain, said he has weathered many hurricanes and is going to ride this one out. Silver Marquez, 34, went from table to table at the crowded El Tapatio taqueria in Kingsville, selling pan de campo, a flatbread traditionally cooked in Dutch ovens at cattle camps in South Texas. Santos Rojas, 72, said he isn’t preparing for the hurricane much beyond buying bottled water and pan de campo. “I am legally blind, so if I try to board up windows I will just smash my thumb,” he said. His son Daniel Rojas, 47, also is disabled and is on dialysis. At the small rural shrine to Don Pedrito Jaramillo, a revered Mexican American folk saint who died in 1907, believers filed in to ask for protection from the storm. Jaramillo, a native of Guadalajara, Mexico, had a reputation for healing in a time and place where few people had access to traditional medical care. Aurora Zapata, 42, a housewife, and her daughter, Dina Zapata, 12, both of Falfurrias, were lighting candles at the shrine Friday afternoon as the first bands of rain began to make landfall. “We are just praying to Don Pedrito to protect us, our whole family and our town from this hurricane,” said Aurora Zapata.